Loaded with omega-3s and coated in a crispy (gluten-free!) coating, these Clean Eating Lemon Herb Salmon Cakes are a delicious way to get your daily dose of healthy fats and high-quality protein. 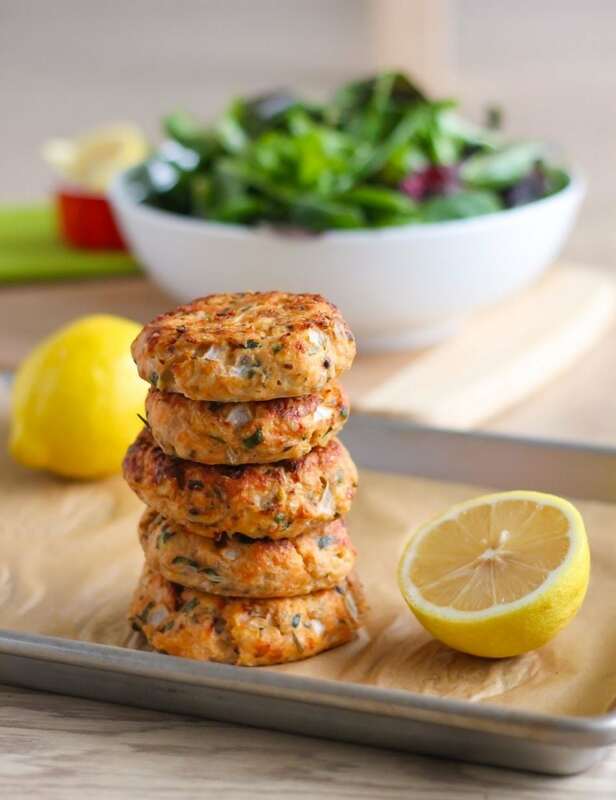 Eat them like a burger, wrap them in lettuce, or enjoy them on their own with a fresh squeeze of lemon. Ok guys. I know it’s only November 18th, but is anyone else getting really, really excited for Christmas!? Those of you in the US still have American Thanksgiving to celebrate next week, but here in Canada, Thanksgiving and Halloween have been and gone and I don’t think I’m the only one who’s got Christmas on my mind these days! This year, my sister and I will be flying over to Bahrain (where I grew up in the Middle East) to visit my dad. It’ll be a beast of the flight, that’s for sure. I’m looking at about 9.5 hours from Vancouver to London, then another 7ish down to Bahrain. Luckily though, we’ve timed it so that I get to spend a full day with my sister in London in both directions. I’m totally pumped about this because she’s lived there for about 7 years now and not once have I been over to visit! Plus, it’s always fun to have a travel buddy. Last week I was describing to some friends at work what living in Bahrain was like, and when it came to food, one of the meals that sticks out most in my mind was a recipe prepared by our next door neighbour, Mike. To give you a little context, Mike isn’t directly related to my family, but we are in a roundabout sort of way. Suffice it to say that he and his wife were like an uncle and aunt to my sister and I while we lived there, and I babysat their two little kiddies a lot. We’d often take turns hosting dinner, and when we went to their house, Mike made what we oh so affectionately referred to as camel droppings. So what exactly were these camel droppings? They were salmon cakes – balls of salmon, mashed potato, onion, and a few other seasonings of his choice. He’d deep fry them and they’d come out golden, crispy, and yes, they looked a lot like camel droppings. They were absolutely delicious. 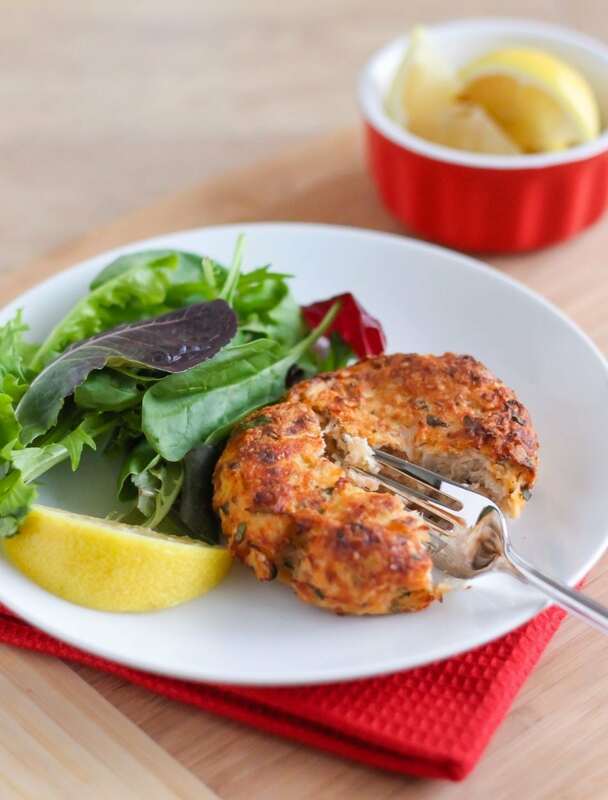 Thinking about these salmon cakes triggered a fierce craving, so this past weekend I decided to give them a go myself – minus the deep frying part. 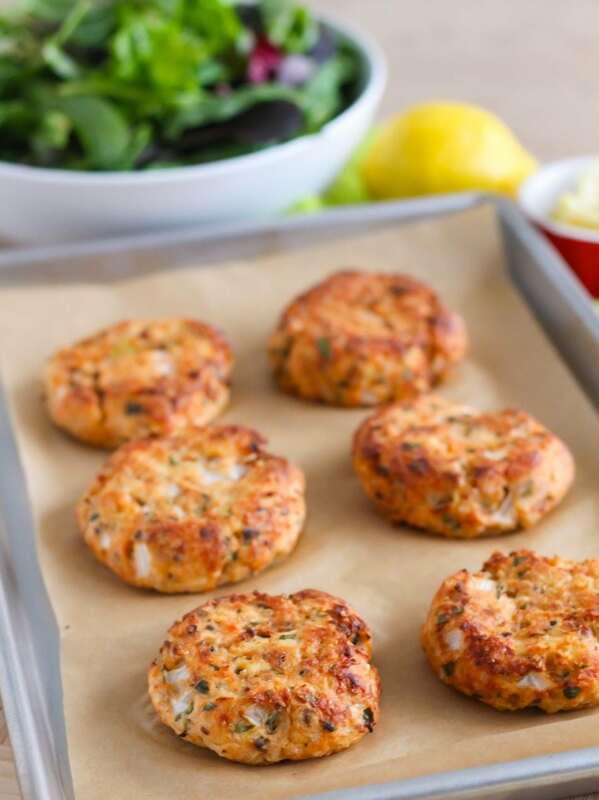 Since it’s fall, I decided to swap the potatoes for parsnips (which totally don’t get enough attention but they are a wonderful veggie), and bake the fish cakes instead of deep frying them. I was a little unsure as to how juicy they’d be when they came out of the oven, but friends, I can confidently say that they turned out exactly – actually, better than I anticipated. Now, remember back to school when math class was all about BEDMAS (that’s brackets, exponents division, multiplication, addition and subtraction for those that need a refresher)? Well good news – you don’t need to do any of that here. The list of instructions for this recipe looks a bit daunting, but I promise you these are super simple to make. 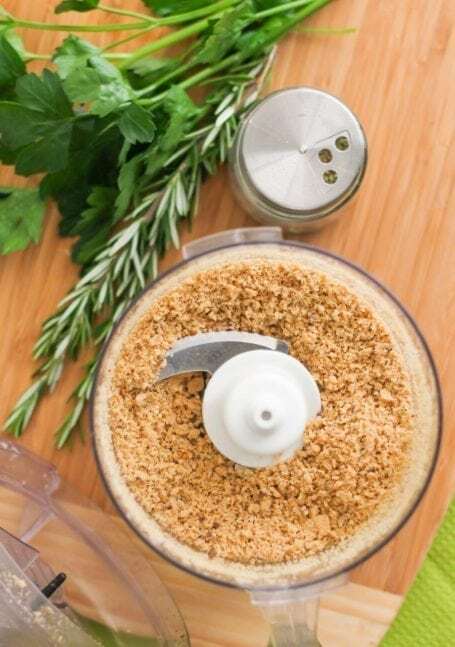 The one thing to know though, is that the order of operations in the food processor IS important. First up is your cracker crumbs. These help to give the cakes a bit of crunch and prevents the mixture from getting too wet. 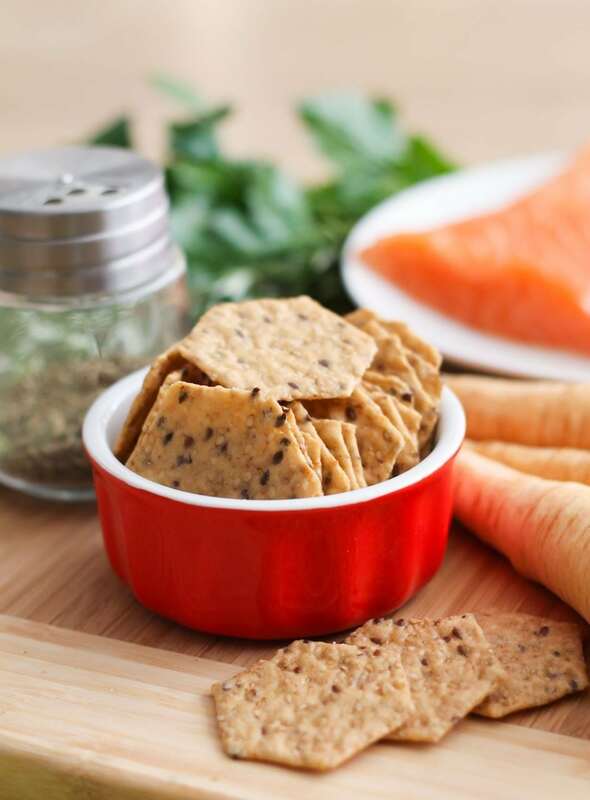 You can use regular breadcrumbs if you like, but my favourite thing to do is whirl up about 25 gluten-free crackers for 10 seconds. 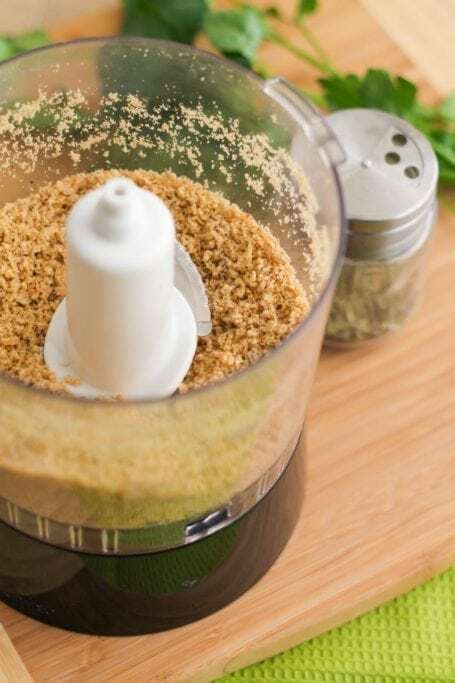 The result is instant crumbs, and you want to do this first before the wet ingredients make the inside of the food processor all sticky. 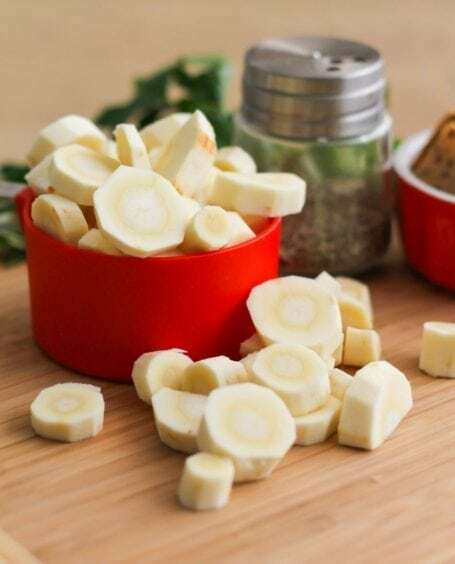 You’ll take the crumbs out of the processor and put them aside, boil the parsnips and roughly chop some onion. No need for neat chopping though because you’ll plop all the onions into the processor and let it do most of the work. 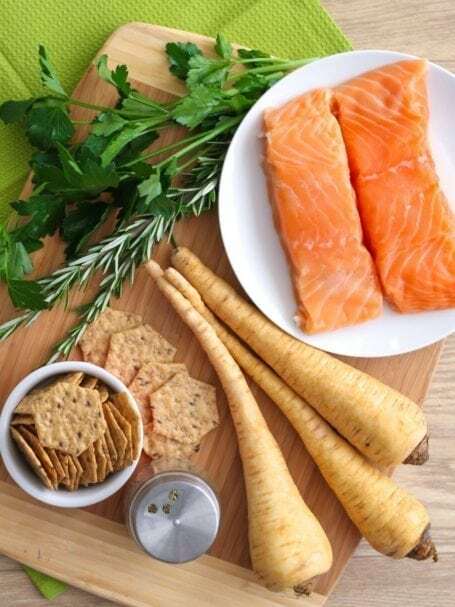 After mashing the parsnips with a fork, you’ll add those to the processor with the salmon and seasonings, and give it a pulse pulse pulse until you’ve got a nice coarse mixture. Golden and crisp on the outside, bursting with flavour and (even though I hate the word I’ll say it anyway) super moist on the inside, these guys make a perfect appetizer or light meal. I enjoyed them so much that they’re on my to-make list again this coming weekend, and I hope you’ll give them a try too! 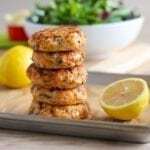 These super juicy, flavour-packed baked Lemon Herb Salmon Cakes started as a craving and turned into a recipe that was even more delicious than I expected! 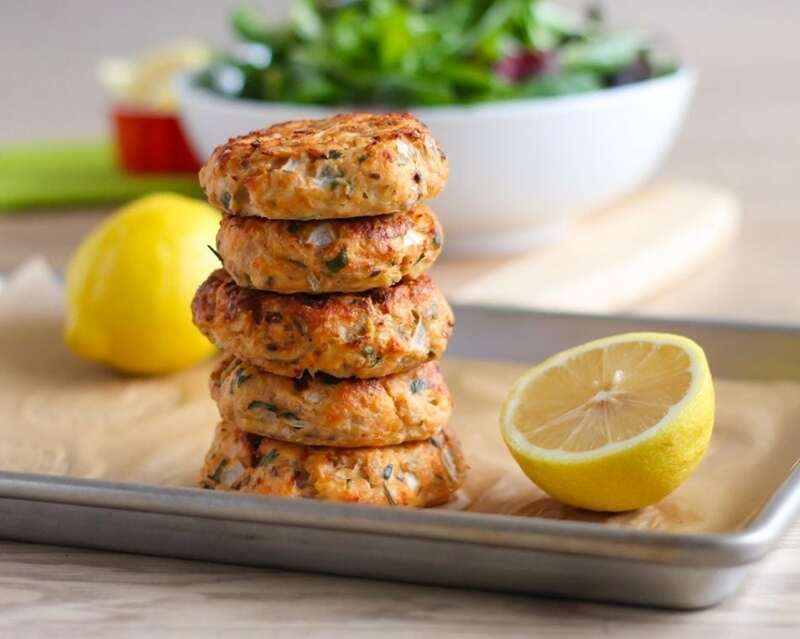 Serve like a burger, wrapped in lettuce, or on their own with a fresh squeeze of lemon for a healthy lunch or dinner. 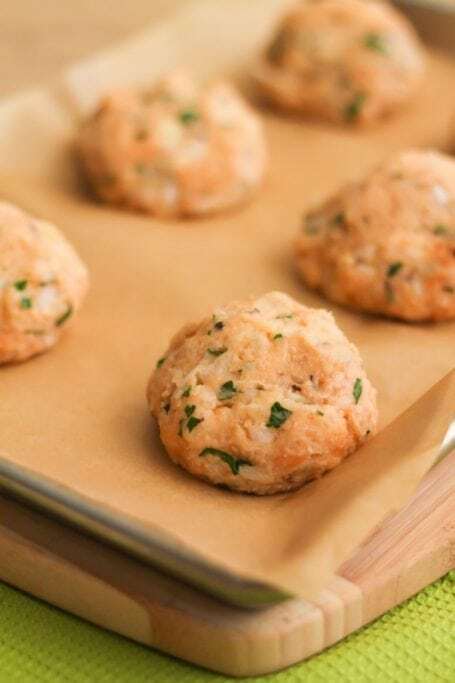 Preheat the oven to 375F and line a baking sheet with foil or greaseproof paper. 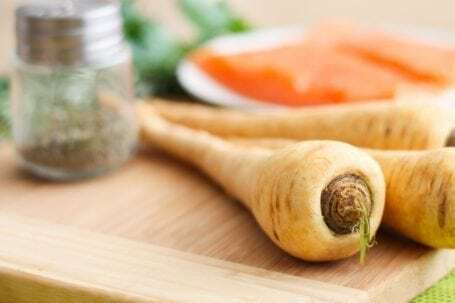 Boil the parsnips in a pot of water for about 5 minutes on the stove, or until fork-tender. Roughly chop the onion before transferring it to a food processor. Pulse on high a few times to break down the onion into very small pieces. Drain the water from the parsnips and use the back of a fork or a potato masher to mash them up. 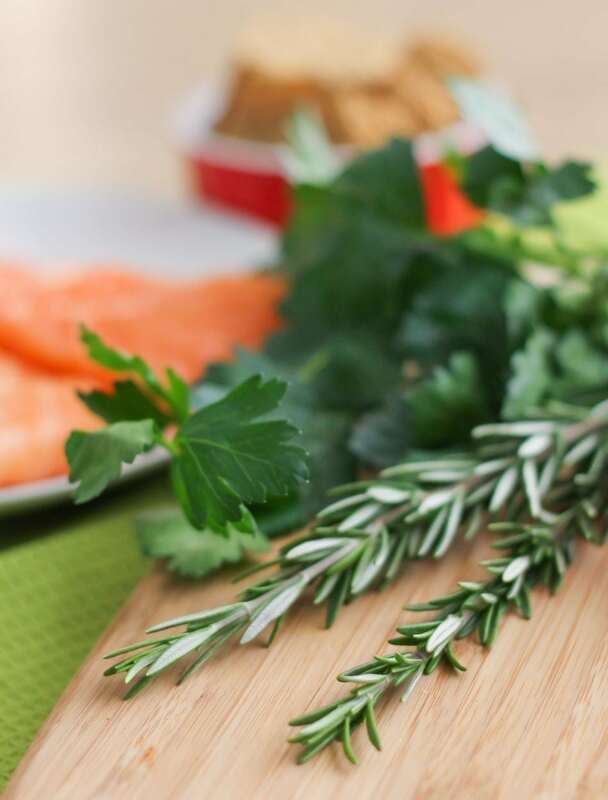 Chop the salmon into pieces about 1″ in size. Pour the mixture into a large bowl and stir in the cracker crumbs and egg whites. 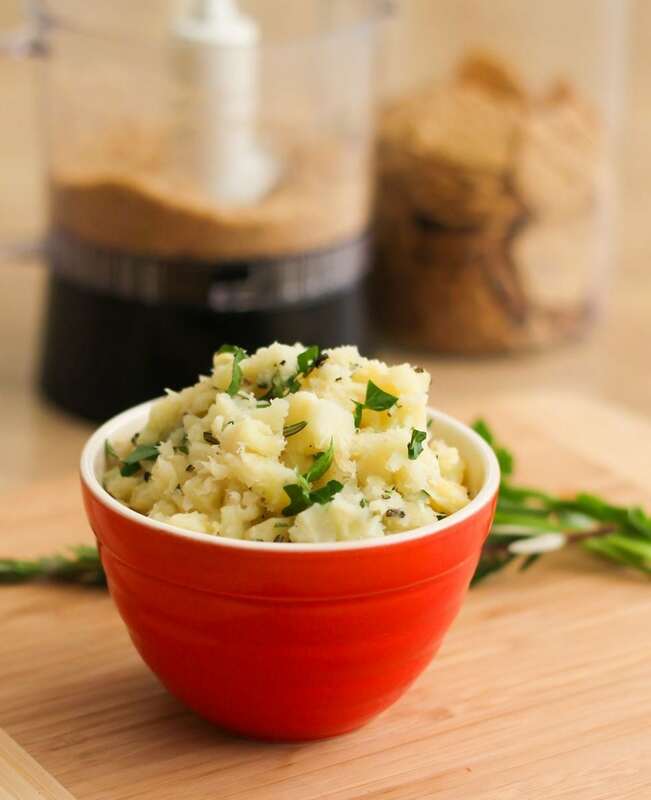 Give it a good stir to incorporate all ingredients. Scoop 1/6 of the mixture and roll it into a ball with your hands. Place it on the lined baking sheet, pressing down on the middle to flatten it down a bit. Repeat with the rest of the salmon mixture. 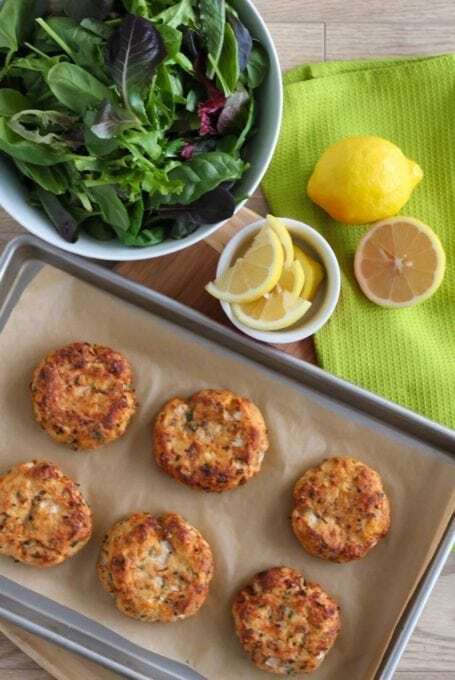 Bake the fish cakes in the oven for 25 minutes, then switch to the broil setting for the last 3-5 minutes of cooking. This will turn the cakes slightly golden on the edges. Serve with fresh lemon wedges on the side if desired, and drizzle lemon juice over top before eating. Are you traveling anywhere over the holidays this year? Weird named foods are ALWAYS the best! My favourite meal when I was younger was haystacks (basically a build your own taco salad) and sawdust (pudding topped with graham crumbs). 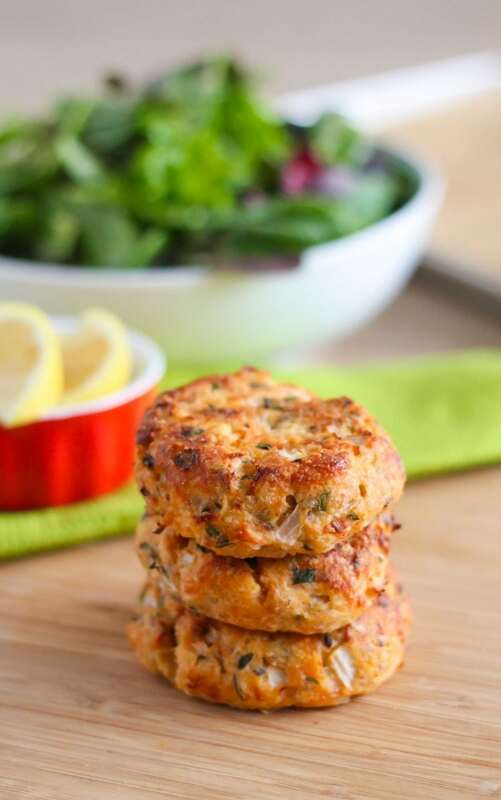 These salmon cakes look DELIGHTFUL! Ooh yes pudding and graham crackers! We used to eat that too but I love your funny name for it. BEDMAS?!? I was taught PEMDAS.